The cadence debate has been investigated by many. The basic experimental protocol used by these researchers has been to take a batch of riders, pop them on to a stationary exercise bike and ask them to ride at a set workload under, different pedal speed conditions, say 60, 80, 100 and 120 crank revolutions per minute (rpm). Using various measures, the investigators are able to ascertain how much oxygen is used in each condition, providing them with an economy figure (the less oxygen used, the more economical that pedal cadence is). Practically all of the economy results for these studies, when plotted graphically, showed an ‘inverted U’ shape, with the extremely low and high pedal cadences being less economical and an optimum figuring somewhere around the middle. There was a general consensus from these investigators that the optimum was somewhere around 90 rpm, some found it a little higher, some lower. My main criticism of the studies was that the investigators addressed too greater pedal speed range, almost forcing an optimum. Who cycles around at 60 rpm after all? If you are quite an experienced mountain biker and have been riding for years, don’t lose sleep over this idea of optimal cadence, because it’s highly likely that you are pedalling at your optimum anyway. Human beings are amazingly adaptive and over a long period of time, your body will learn to function as efficiently as it can, under the circumstances it finds itself. At your preferred pedalling rate, the nerve fibres and muscles get used to contracting at a certain speed and once a pattern is ‘learned’, the whole process becomes very efficient. Rather like lifting a heavy weight when your body is not used to it, cycling at a pedal cadence other than your preferred results in poor technique, muscle miss-firing and wasted energy. With experienced cyclists, most of the research that considered this dimension has found the preferred cadence also to be the optimum. · Crank length: Have you ever noticed how odd your road bike feels when you’ve been used to riding your mountain bike all the time? I used to jump on to my road bike and wonder why I couldn’t turn the cranks at the cadences I was accustomed to. After thirty minutes or so of riding, I found that I needed to spin my legs that little bit faster and gear-down a fraction in order to feel comfortable. This was primarily because the cranks on my mountain bike were longer (175mm), compared with the shorter (170mm) cranks on my road bike. That 5mm difference changed my preferred (and probably optimal) cadence by about 10 rpm. I now have 175mm cranks fitted to both my bikes. Although I’m waffling on about my own experiences, the evidence for this is not entirely anecdotal, as research also supports this argument. Smaller cranks represent shorter levers, and naturally, a rider will shift down a gear to alleviate the higher leg forces, whilst spinning faster in an attempt to maintain the speed of the bike. · Muscle fibre type: Simplistically, riders’ muscular profiles can be categorised into two types: Slow Twitch fibre (ST), or Fast Twitch fibre (FT) dominant. Smaller, skinnier riders tend to be ST dominant. These fibres prefer lower forces and hence favour higher cadences. Larger, bulkier riders have more FT fibres, which favour the higher forces associated with lower cadences and bigger gears. If you are a larger rider, with aerobic training, you can develop your ST profile and you may eventually find yourself spinning that little bit faster as a result. In the meantime, be happy with your slower pedal revs. · Limb length and density: One study I read looked at ‘unloaded cycling’ (spinning the pedals with no resistance) in an attempt to establish the metabolic cost of limb movement. Not surprisingly, the faster the legs were spun, the greater the energy used. Moreover, longer heavier limbs were found to have a higher metabolic cost at high speeds than shorter, lighter ones. The up-shot of this point is again: Don’t spin your legs mega-fast of you are of a larger build; you’ll probably be more efficient at lower pedal speeds. Couple this point with the likelihood that larger, bulkier limbs will contain more FT muscle fibres anyway, and you have two reasons not to spin too fast. One particular research paper identified a key issue. Regardless of the supposed optimum, faster pedal speeds, because they are linked to ST fibre usage, require significantly less glycogen (carbohydrate) than FT fibres, due to their heavy use of fat and oxygen as complimentary fuels. As the body’s glycogen stores are limited, whilst fat and oxygen are not, it was proposed and proven that you will ride for longer if you spin faster. This doesn’t necessarily mean that you’ll ride quicker though. The FT fibres will give you the power to ride fast, even though they use more glycogen. Road racers spin incredibly quickly. This is a technique, rather than an economy issue though. The fast spinning allows them to respond and accelerate quickly if someone makes a break. 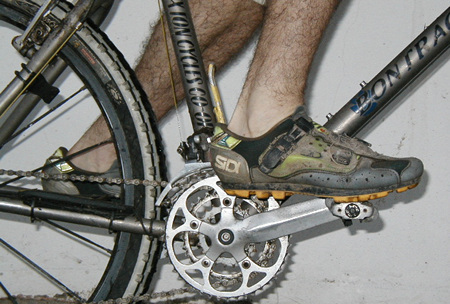 In a similar way, a slower cadence, although not physically optimal, can suit the mountain biker when riding over rough, dry terrain, because the pedals can be used as platforms to lift the body off the saddle as obstacles are encountered. This is very difficult to do if you are spinning quickly and often the full force of the obstacles has to be taken through the saddle. This is unnecessarily painful and will slow you down, especially if you ride a hardtail. A good technical rider will rest very little body weight on the saddle when riding this kind of terrain. As an obstacle approaches, the rider will stand up and pedal over it, still applying power to the drivetrain in the standing position. When the conditions are wet and muddy, faster spinning is technically optimal for the mountain biker. If you are turning over a large gear relatively slowly cadence and your speed is sapped away as you enter a big muddy puddle, you will find it very difficult to get the pedals turning again. In fact, you’ll probably end up dabbing your foot, or even worse, falling sideways into the brown lagoon! Rather like the road-racing example, a faster spinning technique will allow you to accelerate again, despite your momentum having been reduced. Mountain bikers basically have to learn to cope with physiologically sub optimal cadences, because the terrain may warrant it. · Physiologically and biomechanically, everybody’s optimum is different. · Your optimum will vary, depending upon the bike you are using and the circumstances in which you are riding it, be it for a treadmill laboratory test, on the road, or through the mud. · Sometimes, for technical reasons, you need to move away from the physiological and biomechanical optimum for performance benefits. · Pushing a massive gear because you think it makes you stronger. · Spinning far too fast, because all the roadies tell you to.